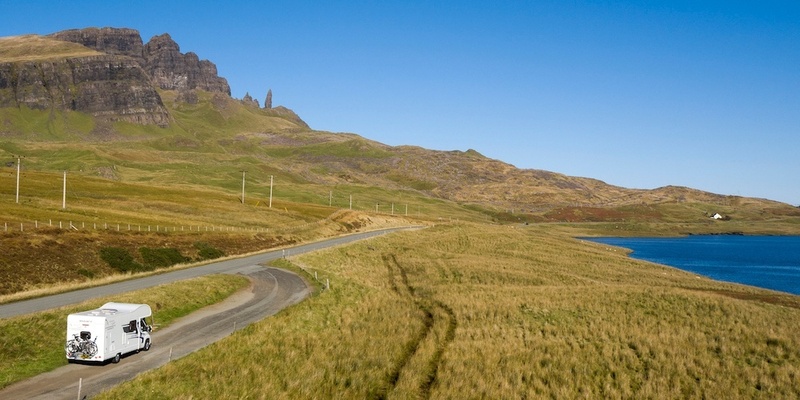 With all its fantastic scenery and miles of spectacular driving roads and routes, Scotland lends itself perfectly to a road trip, and what better way to travel than in your very own motorhome? It’s cost-effective, you have everything you need with you and, the best bit, you’re free to explore at your own pace. If that sounds tempting, but you’re new to motorhome hire and unsure how you’ll handle the experience, read our guide below for helpful tips on how to make the most of your motorhome holiday. When you pick up your motorhome, whether bought or hired, you’ll have a full introduction to the vehicle and how it works. This will set you up nicely for your trip, but don’t be afraid to ask questions if you’re unsure about anything or would simply like to know more – it’s important you’re comfortable and know how to use all the facilities on board before you set off. You could even write yourself a couple of checklists. That way you won’t forget what you need to do before you leave and when you arrive, for example connecting and disconnecting the power, filling up the freshwater or disposing of waste. If you’re hiring a motorhome, make sure you know what documentation you need and have it on hand when you pick up; it’ll make sure you start your trip stress-free. Also, be aware of what your insurance covers and what the company’s terms and conditions allow you to do – there may be restrictions on where you can go, for example. All our motorhomes are fully insured and maintained to ensure reliability so you shouldn’t have a problem hiring from us, but if you do, make sure you know what to do and have breakdown details to hand. Another point to consider that may influence your enjoyment is packing. While you’ll find our spacious motorhomes very comfortable, if you over-pack you’ll fill up the space quickly and find yourself constantly moving things around. Pack with space and the unpredictable Scottish weather in mind! One of Scotland’s most attractive features is its remoteness. It’s easy to get away from the craziness of everyday life and escape to deserted beaches and unique islands, and you should. But, have an idea of your route and where you may want to stop before you leave. We provide you with access to an interactive map of free camp locations that will help along the way, though you may want to avoid relying solely on mobile phones as you’ll likely find your signal drops in and out as you drive around – a hardcopy map is a worthwhile investment. A few other points to note are that, depending on where your adventure takes you, you’ll likely spend time driving on rural roads, some of which may not be suitable for motorhomes, so it’s worth doing a bit of research beforehand. You may find petrol stations are more spaced out than you’re used to as well, so remember to refuel when you get the chance. That being said, don’t get to attached to your plan; you’ll find some amazing spots off the main road and while on a detour. All our motorhomes have fully-fitted kitchens so you’ll be able to take advantage of all the fresh local delights Scotland has to offer. And, if you get the weather, a BBQ outside is the perfect way to spend an evening. When stocking up and deciding on your meals though, think cooking and storage space – you may struggle to make a complicated three-course gourmet meal but cooking that catch of the day you just picked up from the local fisherman, no problem! Most importantly, don’t get caught up in the dos and don’ts, relax and enjoy yourself; it’s a holiday after all! 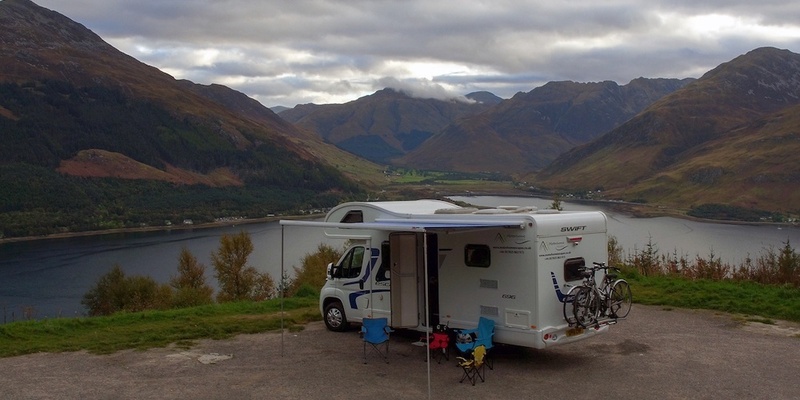 Motorhomes offer protection from the weather and, with heating and air conditioning, you’ll be comfortable no matter what the Scottish skies throw at you. With a TV, DVD player and connection for a PlayStation, there’s plenty of downtime entertainment, and you can carry bikes too – bring your own or hire them as an optional extra if you would like, along with other little luxuries, available here. Whether travelling as a couple, with friends or as a family with young children, there’s a motorhome to suit your needs – see our range of motorhomes to hire and book your Scottish adventure now! Do You Need a Generator When Hiring a Motorhome? What’s the difference between a Motorhome, Campervan & RV?